Lock in a great price for Hochelaga Inn – rated 8.7 by recent guests! The staff were so friendly and accommodating! Lovely large room with unique decor and excellent breakfast included in the morning. Love the little nook for hot chocolate/tea/coffee at any time. Fresh muffins were available too! The location is excellent: a short walk to shops, Queens and the waterfront. Highly recommended! The staff there were so nice and the place was super homey! Loved the breakfast (and the cute old man who worked during the evenings)! The staff and everything else was lovely and the breakfast was very good as well. It’s a clean, well situated, architecturally beautiful house with everything you could ask for in an Inn. Staff are extremely friendly and helpful. We really enjoyed our stay. Beautiful old house. Lovely decor. Delicious breakfast. Perfect location for visiting Queens and easy walking distance to downtown. Closeness to Queen's University where my event was convened. Beautiful old charming house surrounded by tall trees in the historic heart of the city. Hochelaga Inn is within a 5-minute walk from various shops and restaurants in the city center of Kingston. It features free WiFi access and a free daily breakfast. Coffee and tea is served all day. 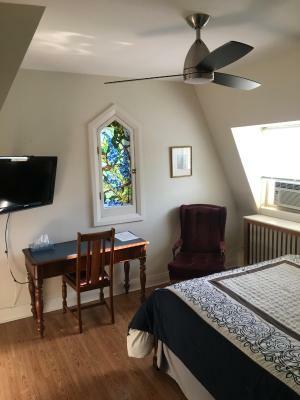 The tastefully decorated rooms at this bed and breakfast offer air conditioning and a flat-screen cable TV. Ironing facilities are also included. Bathrobes and a hairdryer are found in the bathroom. At Hochelaga Inn you will find a 24-hour front desk, a garden and a terrace. The property offers free parking. 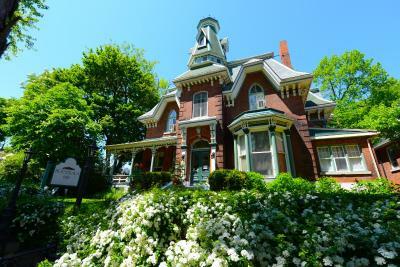 It is at a distance of 1,300 feet from Queens University and the shoreline of Lake Ontario. When would you like to stay at Hochelaga Inn? Tastefully decorated, this room is equipped with air conditioning and a flat-screen cable TV. Bathrobe, toiletries and a hairdryer can be found in the bathroom. This double room has air conditioning and includes a free daily breakfast. The room also features cable TV, free WiFi and complimentary toiletries. House Rules Hochelaga Inn takes special requests – add in the next step! Hochelaga Inn accepts these cards and reserves the right to temporarily hold an amount prior to arrival. Please note that American Express is not accepted at this property. Please present a Visa or MasterCard upon arrival. Bathroom was a little tight. Fabulous breakfast. Nice peaceful setting. Booked a return visit already. We felt welcome immediately. All the staff were amazing (Olivia, Kate, Corey and Simon), super-friendly and very accommodating. The upgraded room was roomy and the bed was extremely comfortable. I didn't want to get out of it, except that we were so excited about discovering even more of all the wonderful historical surroundings in walking distance (the day before our stay, we both racked up over 12000 steps. We also matched it the following day!). The included breakfast was wonderful and made-to-order. There was coffee available all day in the lobby and little cakes. It feels like you are in a lovely residential area, but the main drag (Princess St.) is only blocks away. I highly recommend what we felt must be the best deal in town on that street for a meal: 'Score'. It is a fantastic, casual but very clean pizza place with wood-fired pizzas made to order at a flat rate with a myriad of choices and is licensed for beer and wine. Everything went very smoothly. We took the #18 bus ($3.00-have exact change) directly from the train station to a bus stop only a few blocks away and definitely in walking distance to the 'Hoch'. If you have too much luggage, a cab from the train station is roughly 20.00 including tip. We are already planning our next trip to the 'Hoch' and to Kingston. Our best vacation in years, even though it was a very short one (2 full days). Overall, the house and rooms need a little updating. Room was spacious, bed was comfortable, staff are accommodating, good breakfast . This place is an Inn, a very large old house. Simon on reception could not have been more helpful. Gave lots of advice for eating and also some historical information about the city. The room was excellent; great furniture; big, comfy bed! Parking on site is very handy. Coffee is always available from the lobby and is Illy - fantastic Italian. Freshly baked goods were also on the side for any guest to enjoy :) Would 100% recommend and stay again. We’d booked a room with two beds, and we’re given a room with one bed and a pullout. Knowing that we were disappointed, they explained that they can’t promise two beds, and a larger group had been given preference. The pullout had no linens or blankets, and we had to make a late night request and make it up ourselves. And there were no fitted sheets on either bed - which is always a bit uncomfortable . The inn felt honey and relaxed. There was unlimited blueberry water, coffee, tea, and biscotti. Simon went out of his way to help us get settled. Sheets too short for beds! To be honest I didn't find anything wrong with the place. For an old place it is kept nicely. The location is very nice in a quiet street, the place was clean and really cozy, the staffs were amazing, and breakfast was excellent in a nice welcoming dining room. Excellent breakfast. The staff were very welcoming and the building is beautiful. The location is excellent and there is parking available very nearby. Beautiful place but street noise at night was horrible ... I couldn't sleep it was so loud. Hopefully that isn't an every night occurrence.